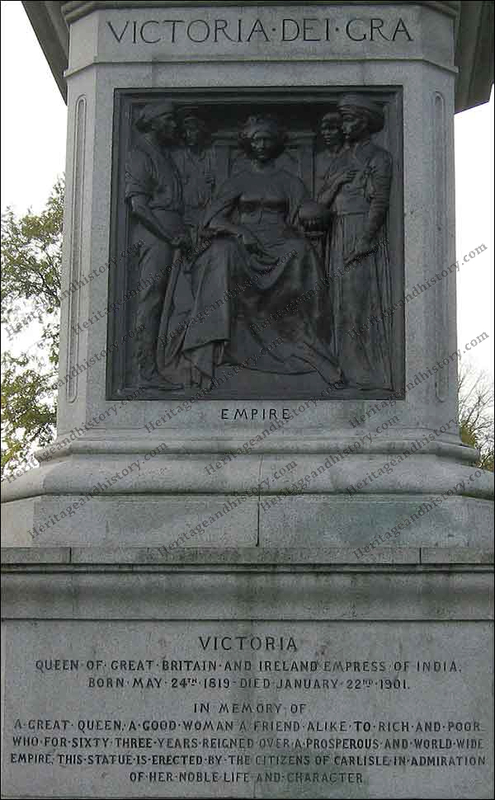 Standing high on a pedestal overlooking a former rubbish tip in Carlisle is the iconic figure of Queen Victoria. With Orb in one hand and Scepter in the other it is a classic Queen Victoria pose captured by Thomas Brock RA. 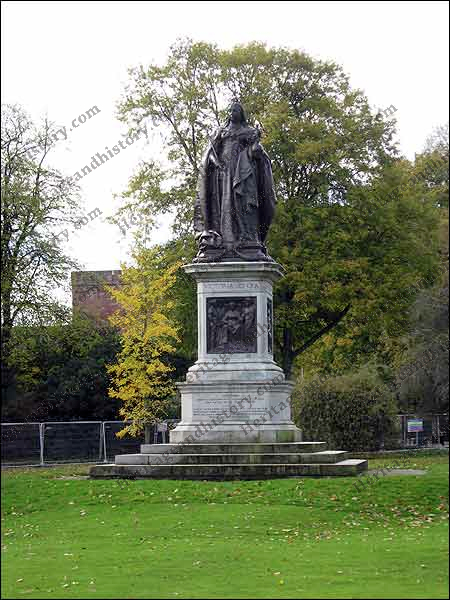 According to the Council for British Archaeology the statue was erected on the 7 May 1902. This was just over one year since the Monarch died. Victoria Park is part of the larger Bitts Park area of Carlisle and occupies land between the River Eden and the Castle. The ‘bitts’ were thought to be small parcels of land that were used for grazing. Bitts Park was the very first public park to be established in Carlisle. The formal gardens that contain the statue of Queen Victoria were laid out in the 1890s on the site of a rubbish tip! Queen of Great Britain and Ireland. Empress of India, Born May 24th 1819, Died January 22nd 1901. A great Queen, A good Woman, A friend alike to rich and poor, who for Sixty Three Years Reigned over a prosperous and World wide Empire. This statue is erected by the citizens of Carlisle in admiration of her noble life and character. Very little information about this memorial seems to be available on the internet. If you can add to the history please let us know via the contact us page or via the comments section below. Empire, Education, Science and Art, Commerce. On each of the four sides of the plinth are bas-reliefs presented by the Mayor. Benjamin Scott JP, George Dove JP, William Hudson Scott JP and John Jackson Bell in 1902. Each tableau depicts the symbols of Empire as seen by those of the day, Empire, Education, Science and Art, and Commerce. Born in Worcester, Brock came to London in 1866 to train in the studio of the sculptor, John Henry Foley. On Foley’s death in 1874, Brock completed a number of Foley’s commissions and for almost the following fifty years was one of the most prolific sculptors of public monuments and statuary in Britain. He sculpted numerous statues, such as that of Sir Henry Irving which stands just north of the National Portrait Gallery and the huge memorial to Queen Victoria in front of Buckingham Palace. This most prestigious of his works, in collaboration with Aston Webb, 1901–9, earned him his knighthood at its unveiling in 1911. He exhibited at the Royal Academy from 1868 onwards, becoming a Royal Academician in 1891. In 1905, he became the first president of the Royal Society of British Sculptors.